We notice that a lot of searches for “ice dams” on our blog this year. While ice dams are a winter peril that we New Englanders have become all-too familiar with, some of our southern neighbors may be meeting them for the first time. We’ve updated information from a prior post to offer some key facts. How do you know if you have ice dams? 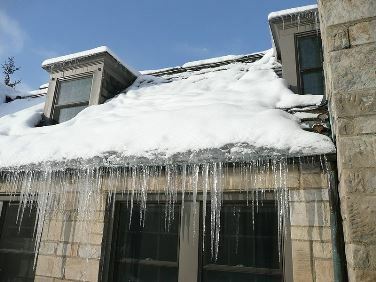 Essentially, if you have large icicles hanging from your roof, you probably have an ice dam problem -see the photo above. The icicles are the symptom, not the underlying problem, which is generally one of insulation. The University of Minnesota Extension offers a solid explanation of what ice dams are and why they occur, as well as information about prevention. Don’t miss the excellent diagram that shows why they form. Your best bet is to hire an experienced professional to do this – it can be a risky task. Some folks want to go out and chop away at icicles, but it’s not a good idea to be climbing on snow- and ice-covered roofs or using ladders on slippery ground. Plus, using the wrong tools to remove snow or chunks of ice from your roof may cause further damage to your shingles or your gutters. Not to mention damage to you: flying ice chunks can be very heavy and sharp. Many people also use salts or other chemical concoctions to deal with ice dams, a less-than-ideal “fix” because chemicals can damage or discolor your roof and can leach into the ground, damaging plants and greenery. If you have a low roof, one of the most common ways that people deal with ice dams is by purchasing a specially-designed roof rake and removing snow from directly above the ice dam. Again, this can pose risks to both you and your roof. While ice dams can sometimes occur as a result of freezing rain, more often than not they are a symptom of an insulation problem which should be addressed because there are other problems besides ice dams that can occur, such as a build-up of moisture that could lead to rot, mildew or mold. Not to mention that with poor insulation, heating costs are almost literally going through the roof. While there are a number of products that can treat the symptoms and prevent ice dams, the best way to protect the value of your house would be to enlist the expertise of a weatherization, insulation, or energy conservation contractor to diagnose the and remedy the root problem. Builder and consultant Paul Frisette offers his thoughts on why ice dams form and how to prevent ice dams by treating the root cause, not just the symptoms. When in doubt about your coverage, call your agent – that’s what we’re here for!